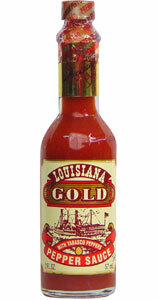 The Louisiana Gold hot sauce line is produced by Bruce Foods. According to﻿ their website, Louisiana Gold Pepper Sauce is "The Gold Standard of Hot Sauces." These quality, all natural sauces are still produced right in the heart of Louisiana's Cajun country. Traditional Cajun style hot sauces are simple blends of either cayenne or tabasco peppers with vinegar and salt. Louisiana Gold takes the concept to the next level by combining both styles of peppers for this premium sauce. The resulting sauce features a smoother taste than traditional tabasco sauces with a little extra heat than what you'd expect from a cayenne red pepper sauce. The best thing about Cajun style hot sauces like Louisiana Gold is their versatility. Foods like eggs, pizza, tacos and burgers can all benefit from a shot Louisiana Gold. I used the sauce on Mexican fixtures, tacos and nachos. It's also perfect for adding an extra kick to my jambalaya casserole. The heat level of Louisiana Gold is fairly substantial. However, it's sneaky heat. It doesn't really hit until the sauce makes it to the back of your throat. That's when the burn sets in. The fact that it's not overpowering as soon as it hits your tongue makes it the perfect accomplice for most foods. It allows the flavor of the food to stand out and follows it with it's signature spice. Louisiana Gold really does set the standard for Cajun style hot sauce. The blending of cayenne and tabasco peppers gives the sauce an added depth not found in most sauces of its kind. To learn more bout the Louisiana Gold product line, click the title of this review. See how Louisiana Gold Pepper Sauce rates compared to other sauces on The "Q" Review's "Product Reviews" page. 0 Response to "Louisiana Gold Pepper Sauce"